Lindypoo! Thanks for the add! I must say, I do look great on your blogroll! ::snicker:: Love your latest entries!! Hope you have a gorgeous April Fool's Day! super pics, i am trusting, am i a fool? Nope, Jain...you are no fool! Joyce...I did not take that first gorgeous one. But did the others. I thought jumping a horse with no saddle and no hands took some major trust! Linda, I love all the photos. Roxy is a love! And your daughter is not only brave and talented, but beautiful as well!! ..., some major trust as well as a great sense of balance too..., I would have been so nervous taking that shot! Climbing up a tree is not the hardest part, coming back down is, or was for me anyway..., and the fire dept. had to come to my rescue..., I was an eleven year old monkey then. 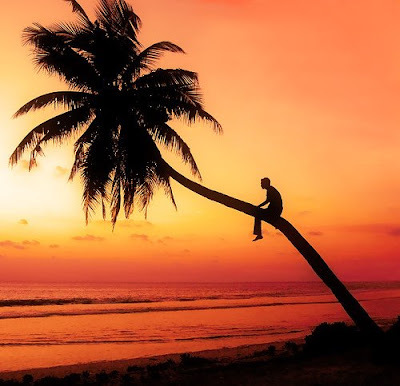 I absolutely LOVE the fiest photo of the Palm Tree! That inspires me to paint!! such talent... that daugher of yours... lovely. Your daughter's so cute! And I love the photo of the horse's eye. I've always loved their eyelashes! is that your daughter ? i LOVE the 'horses eye'pic. it makes me miss my hershey. Oh gosh! You have horses, too? I am a horse person since forever. There is nothing in the world better than staring into their warm brown eyes and feeling their breath on your bare skin. Gorgeous paint, by the way. Beautiful photos. You must be beyond proud of your lovely daughter. The latter pic makes me feel like the rider is flying! I only get to ride once a year when visiting my father... and though a trip to see him isn't planned until December, I'm already dreaming of it, thanks to these pics of your daughter! My horses are still at my parents' in NM. I have my old show horse there (in retirement at the age of 29 now!) and a younger, sillier horse that's 5. Mac and Mickey. Hoping to get our property fenced soon so that I can at least get Mickey up here! I love the photos of your daughter, Linda--SO cool. She IS brave and beautiful!